Safety apparel doesn’t have to be boring. Don’t you get tired of reaching for the same old dreary style every morning just because your occupation requires that you wear protective work gear? Put this Wrangler Men's Blue/Red Plaid FR131RD Flame-Resistant Wester ... (see full details) (see specifications) #FR131RD. Safety apparel doesn’t have to be boring. Don’t you get tired of reaching for the same old dreary style every morning just because your occupation requires that you wear protective work gear? Put this Wrangler Men's Blue/Red Plaid FR131RD Flame-Resistant Western Work Shirt in your workwear line-up for a shirt that looks good and provides the protection required by your demanding job. You may wear this men's blue shirt for its durability and protective flame resistance, but you'll reach for it again and again for its good looks, comfort, and style. Wrangler chose an upbeat red and blue plaid on a white background for this FR shirt, creating a fresh look that goes with anything from blue jeans to canvas to khaki work pants in any color. And since it’s manufactured in a 6.5-ounce lightweight blend of 88% cotton and 12% Nylon FR Sateen with Nomex FR thread used in all the seams, you get a Wrangler work shirt that provides both flame resistance and crisp, breathable comfort that will hold its good looks all day long. Classic western styling adds flair to this workhorse of a button-down shirt. It features a comfortable, easy-on-the neck spread collar, and western-style front and back yokes offer a good fit and room to move. The men's plaid long-sleeve top front closes with easy-to-operate snaps, and there are three snaps on the generous cuffs. Two front spade-shaped pockets feature flaps that close with snaps for style and security, and the left pocket features a pencil slot for convenience. 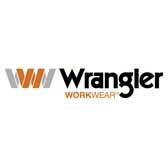 The Wrangler FR logo label on the left pocket lets everyone know you mean business when it comes to selecting flame-resistant workwear. And with all this style, you also get men's workwear that provides flame-resistant protection. It meets NFPA 70E, ASTM 1506 and OSHA Rule 1910.269 standards and NFPA 2112 requirements. It's rated HRC2, ATPV 9.5 CAL/CM2. For added safety, there is a safety orange ID for high visibility on the left sleeve. With the Wrangler Men's Blue/Red Plaid FR131RD Flame Resistant Western Work Shirt, you can have flame-resistant safety without compromising style. And since it’s so easy to wear and looks so good, there’s no need to save it just for work. It’s a perfect choice when the workday ends, too. Order yours right now at Working Person’s Store. Wrangler Shirts: Men's Blue/Red Plaid FR131RD Flame-Resistant Western Work Shirt is being added to your cart.